“11 to 15 February 1227 B.C.E. 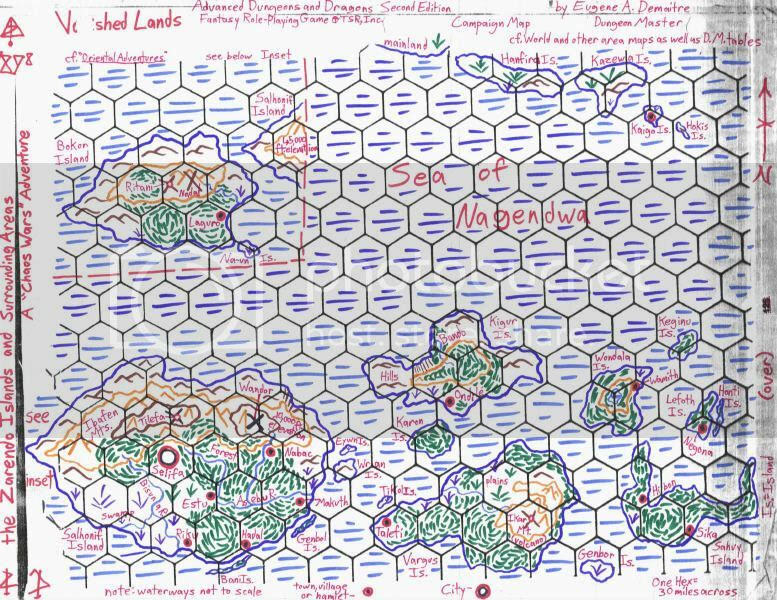 :” On the way from Tarvulis Island to Bokor Isle, the Sea Elven schooner Foamrunner encountered a violent storm, a Siren disguised as a shipwreck victim, and a Kuo Toa in a chariot drawn by sharks. Scully sensed a frightful presence, possibly a dragon. At the open port of Laguro, Elsa befriended fellow brewer Ghalil ibn Rashid. At the “GlassCraft” shop and officers’ club, experienced plane traveler “Milos Volorn” [Beruk] gave time-displaced Tempestade advice and provided more magic items. The onetime circus performers then leave the pirate haven and sails eastward on the Sea of Nagendwa. The group decides to split into two away teams at the port of Riku on Salhonif Island. However, Tempestade notices that the Foamrunner has slowed. He looks over the rail and is raked by toothed tentacles! Tempestade alerts Capt. Scarlet and the rest of the crew and passengers about the giant squid attack. Mighty Hamfast swings his new war hammer at the beast, and Giacomo casts Magic Missiles in the form of force arrows. 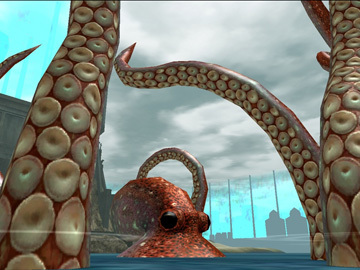 The northern humans sever two of the squid’s limbs. Hill Dwarf Elsa summons a water Elemental, whom she nicknames “Puddles.” The cephalopod strikes Tempestade and Hamfast, but Sir Torrel misses with his sword. Gnoll Scully fires arrows from the crow’s next but also misses the writhing tentacles. Tempestade dodges rubbery appendages, while Corwin struggles to help the Sea Elven sailors with damage control. Giacomo and Hamfast continue to pummel the squid, and Elsa sends “Puddles” to hit its center mass. She also readies Call Lightning. In a burst of ink, the giant squid swims away. Sometime later, the Foamrunnerarrives at Riku and sends dinghys to bring the two squads ashore. Capt. Scarlet agrees to return in a week. Giacomo, Scully, and Tempestade enter the town first. 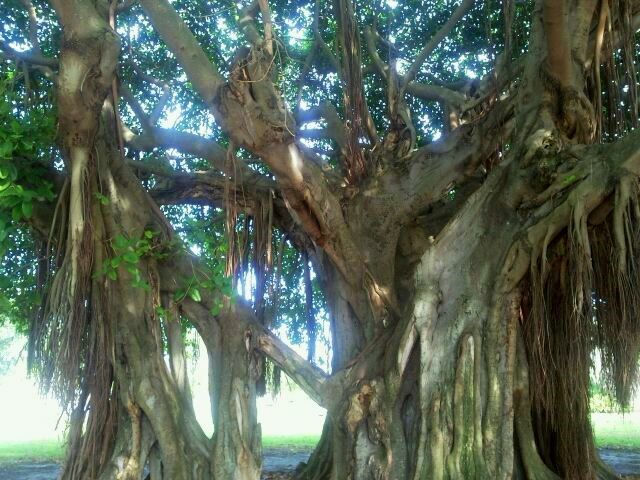 Mage Giacomo inquires about lodgings and finds the “Vine Inn” nestled among the roots of a giant banyan tree. Ranger Scully dons a piratical eyepatch and sells the severed tentacles. Dark-skinned Monk Tempestade enjoys the warm, humid surroundings and blends in with the local people. The second away team consists of Elsa, Hamfast, Sir Torrel, and Corwin. Druid Elsa leaves her brewing gear on the Foamrunner and poses as a botanist collecting plant and soil samples. Fighter Hamfast and Paladin Torrel serve as guards, and Bard Corwin is easily distracted by attractive women. Giacomo puts on scholar’s robes and sits down to a dinner of smoked goat and lentil stew with Tempestade. Scully talks with Layla Star-Eyes, a Zarendo human and captain of the Silver Manta. The corsair tries to recruit Scully and explains that most tribes in the archipelago are matriarchal. On their way to the inn, the second squad stops in the market. Elsa notices trade in coffee, cocoa, and fruits and buys some mango wine. Hamfast is smitten with Tineka, an Ophidian N’anga (snake woman Cleric) of Tiamat who invites him to spend the night at her hatchery for the community’s Reptile Folk. Sir Torrel notices something flying low overhead. The curious Hifalendorin knight follows the avian humanoid to a second-story ledge, where the Aarakocra passes a message to someone inside. Elsa overhears snippets of conversation in Infernal. The two teams meet at the inn before going to a round rented house. Giacomo contacts Makena Walabu, the wife of a local hunter referred by Milos as a guide. Elsa and Corwin calculate costs in Riku at 20 gold pieces per person for food, lodging, clothing, and supplies for their tropical expedition. That night, Giacomo, his homunculus familiar Gerald, and Tempestade go to a tavern. Hamfast helps Tineka keep the hatchery warm and shares his dream of making his name in the barbaric port of Gisar. Scully stealthily follows Hamfast and keeps watch from a discreet distance to make sure the Zeda human comes to no harm from the priestess of the mother of chromatic dragons. Elsa arranges with Makena to hire porters for the jungle. Sir Torrel and Elsa track down the Aarakocra. Colorfully plumaged Kito says he is a messenger. 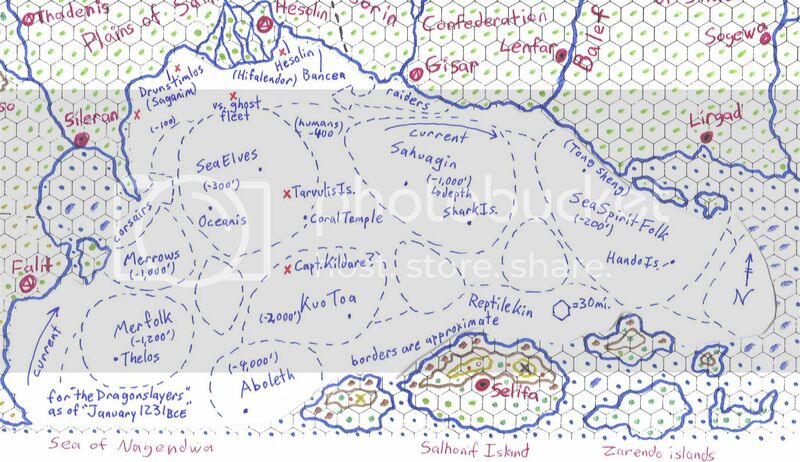 When the outlanders mention that they are headed to the city-state of Selifa for sightseeing, Kito recommends a slight detour to Estu, a ruined Lizard Folk village now inhabited by intelligent apes. At the tavern, Giacomo introduces himself as “Mortimer,” and Tempestade names himself “Miguel.” Lizard Man prospector Nopaltzin [Brian W./ Non-Player Character] buys a round for everyone, but Keilana Sirocco [Sara/N.P.C.] steals some of his gold. Overly friendly barflies Sridan Vasuprisan [Rich/N.P.C.] and Oyabu [Alex/N.P.C.] get Mortimer drunk and offer to bring him upstairs. Watchful Miguel shoves them back, starting a bar brawl. Nopaltzin happily wades into the mayhem. Mortimer throws up, and curious Keilana lifts up his cloak, revealing Gerald. The thief screams. Miguel tosses banana beer at Sridan, and Mortimer shakily casts Sleep, incapacitating Oyabu. Sridan grabs Gerald by the neck and runs out. Keilana searches Oyabu’s pockets and knocks him out a second time while Tempestade and Giacomo run after Sridan. Giacomo casts Magic Missile at Sridan, freeing winged marionette Gerald to fly back to him. Tempestade drags Giacomo and Gerald back to the rented house. The next morning, Giacomo nurses a hangover, as well as a fever. Makena confirms that a tribe of apes lives in Estu and adds that they were rumored to have been drawn there by the “Eye of Heaven,” a magical gem. As the group enters the rain forest, Druid Elsa casts Endure Elements on her companions. Hamfast applies “Satim’s Bane,” an alchemical insect repellent, but Sir Torrel suffers in full armor. The porters carry water, food, and camping gear on long poles. The adventuring party hacks its way north into the jungle, surrounded by the strange sounds of birds, monkeys, and other creatures. Tempestade expresses doubts about whether he can persuade the group to help him free fellow slaves in his own time, but Giacomo notes that there are places for them to resettle. Scully scouts ahead and climbs a tree for a better look. The tree canopy stretches east, while a grassy savannah is to the west, and Mount Tilefa smokes far to the north. Shedding fur, Scully climbs as high as the branches will bear her, and she spots pterodactyls circling overhead. The Ranger is further surprised when she realizes that something large is munching leaves right next to her! She offers a branch to the placid brachiosaurus and hears another dinosaur approaching. Makena identifies it as a “Mouth That Walks,” and the caravan scatters. Elsa sticks with Makena, Corwin, and the porters, as Tempestade uses his enchanted boots to ascend into the trees. Scully slides into sniping position and draws her bow. A tyrannosaurus rex bites into the brachiosaur’s neck and leaps onto its back, tearing out hunks of flesh. Giacomo and Hamfast back away, and Sir Torrel readies a Spirit Hammer. Bloodthirsty pterosaurs and velociraptors arrive to share in the kill. Elsa switches from Calm Animal to Wind Wall, pushing back raptors pursuing the retreating wanderers. Tempestade talks with animals to dissuade one scavenger from from attacking. Scully uses the Lens of True Sight to discern that the tyrannosaurus and some of the other reptiles are in fact people transformed by the Pit Fiend at Mt. Tilefa. Another raptor runs after Hamfast and Sir Torrel, but Giacomo casts Sleep on it. The explorers are more cautious as they continue through the jungle toward Estu, where they see apes and Wemics…. It was good to see most of you last night, and thanks again, Rich, for hosting. Happy Birthday to Sara and Bruce! Sara, I hope you feel better soon, and Bruce, enjoy Winter Fantasy! I look forward to resuming the “Vanished Lands: A New Dawn” telecom campaign next Sunday. Jason E.R. and I will let everyone know when his “Glassworks: the Devil’s Den” and my “Vanished Lands: Vistel’s Circus” games will meet in February. Posted on February 4, 2014 February 16, 2016 by GeneD5Posted in Fantasy & Steampunk, Games, Vanished LandsTagged Basic Fantasy Role-Playing Game, Party 39, retro-clone, rpg, update, Vistel's Circus. Next Next post: “Glassworks: the Devil’s Den” Session 1 — Breakout!